The warming climate may cause the release of a massive, unanticipated burst of methane and carbon dioxide long-locked up in permafrost beneath Arctic lakes by the middle of this century, according to a new study from NASA. Permafrost has been thawing more rapidly as a result of the warming climate and mean annual temperatures have been rising more rapidly in the Arctic and polar regions than they have been in temperate and tropical climate zones. The rise has been gradual, at least that observed by climate scientists and factored into climate change models, and has been considered minimal in terms of its net contribution to global climate warming. NASA researchers found that thawing of permafrost buried beneath a certain type of Arctic lake known as thermokarst lakes, can accelerate the process and result in correspondingly abrupt, and potentially massive, releases of both carbon dioxide and methane, a more potent, but shorter-lived greenhouse gas, in a process known as abrupt thawing. Thermokarst lakes are actually formed by thawing permafrost. Releases of carbon dioxide and methane gas that may result from abrupt thawing of Arctic permafrost aren’t taken account of in climate projections, NASA highlights. The frozen soils, or permafrost, in the Arctic serve as one of the largest natural reservoirs for organic carbon storage in the world. Once thawing begins microbes in the permafrost soils convert that stored, organic carbon into gaseous form – carbon dioxide and methane. The greenhouse gases then rise up into the atmosphere and contribute to global warming by intensifying the Greenhouse Effect. An international team of US and German research scientists used a combination of computer models and field measurements to carry out the study. They determined the rate of climate warming from abrupt thawing more than doubles previous estimates. More specifically, they determined that the rate of abrupt thawing increases the release of ancient organic carbon stored in permafrost beneath thermokarst lakes across the Arctic region anywhere from 125-190 percent as compared to gradual thawing alone. Study lead author Katey Walter Anthony of the University of Alaska, Fairbanks believes that incorporating greenhouse gas emissions from abrupt thawing of thermokarst lake permafrost is important for understanding the role of permafrost in the global carbon budget. Human-caused fossil-fuel emissions are the largest source of greenhouse gas emissions to the atmosphere. Methane emissions from thawing permafrost account for just 1 percent of the climate science’s estimate of the global methane budget at present, Walter Anthony pointed out. The research team also highlights that the UNFCCC Intergovernmental Panel on Climate Change (IPCC) considers greenhouse gas emissions from abrupt thawing of permafrost equally important in its moderate reductions of emissions and its extreme business-as-usual scenarios. In effect, this means that large methane releases from abrupt thawing are likely to occur even if the human production of greenhouse emissions were reduced. 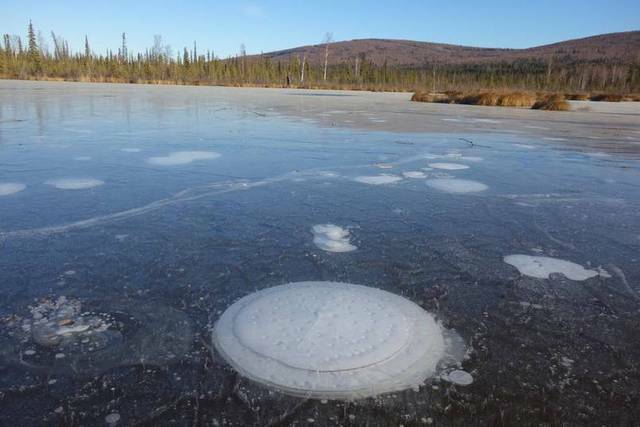 “The mechanism of abrupt thaw and thermokarst lake formation matters a lot for the permafrost-carbon feedback this century,” said Walter Anthony. Walter Anthony led the project, which was part of NASA’s Arctic-Boreal Vulnerability Experiment (ABoVE). ABoVE is a 10-year program to understand climate change effects on the Arctic.